An explosion outside a chemical factory in the northern city of Zhangjaikou has killed at least 22 people and injured another 22, Chinese media reported today. It was the second major explosion at an industrial facility this week, following a blast at a machine factory in Jilin on 23 November, which killed at least two people, injured 57 others and caused damage to around 370 households nearby. Another two people were killed at a construction site explosion, also in Jilin, the following day, 24 November. The explosion outside the Hebei Shenghua Chemical Co plant in Zhangjiakou’s Qiaodong district, occurred in the early hours of this morning. The company denied the blast was connected to production at the plant but officials from the municipal work safety bureau told The Paper that the blast had occurred at the factory gate where a truck carrying dangerous chemicals was waiting to enter the complex. 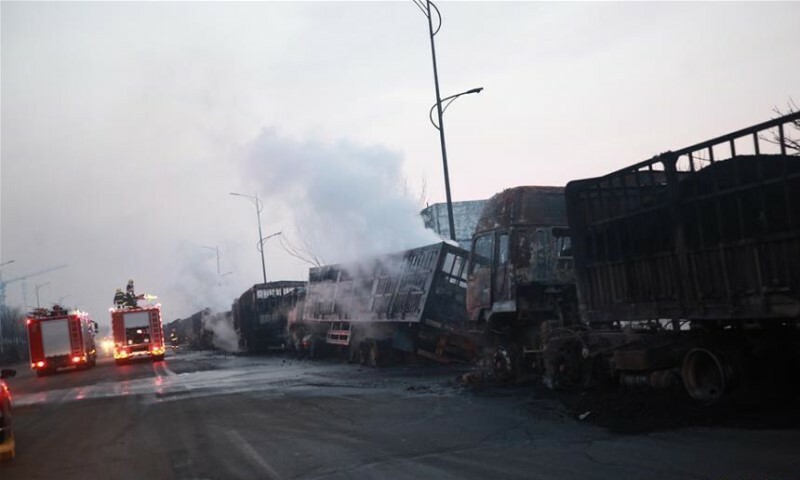 It is unclear if the truck concerned belonged to Hebei Shenghua Chemical Co. or not, and the exact cause of the explosion is still under investigation. Aftermath of the explosion and fire outside Hebei Shenghua Chemical. Photo: Xinhua. Although the number of work accidents and deaths in China has steadily decreased over the last decade, workplace accidents, injuries and deaths are still commonplace and occur in a wide range of industries from coal mines to food delivery and sanitation workers, who are routinely injured or killed in traffic accidents. CLB’s Work Accident Map, which provides a snapshot of work safety in China, has recorded around 480 incidents so far this year, including 40 explosions. Some of the most recent incidents include an explosion at carbon products manufacturer in Shandong on 12 November, which killed six and injured five people, and a blast at a fertilizer factory in Hebei that left six dead and seven injured on 7 November. Following the massive explosion and fire at a chemical storage facility in Tianjin on 12 August 2015 that killed 173 people, including 104 firefighters, the Chinese government vowed to better regulate chemical production and storage facilities but government safety inspectors have little authority to enforce safety standards in the workplace and little has been done to really make work safety a priority, even in the coal mining industry where the reduction in fatalities has largely resulted from production cutbacks and worker lay-offs. Employers routinely hire unqualified personnel to perform dangerous jobs, and workers are given little or no training and minimal safety equipment. In construction sites, which are the most dangerous workplaces in China, accidents occur on a daily basis with workers either falling from a height or being hit by falling objects or killed as a result of structural and mechanical failures. Workers in all sectors are often pushed to take safety shortcuts in order to get the job done as quickly as possible. This trend is most obvious in the ubiquitous food delivery business in China’s cities where workers are just about forced to break the law and risk their lives in order to make a decent living. Friends of China Labour Bulletin promotes labor rights for Chinese workers by seeking official recognition of the right to freedom of association and the right to free collective bargaining in China.